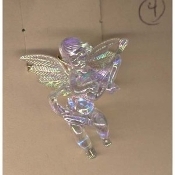 Huge Funky CUPID CHERUB PLAYING MANDOLIN GUITAR PENDANT NECKLACE - Big Seasonal Spiritual Holiday Heavenly Baby ANGEL Music Teacher Musician Novelty Costume Jewelry - Large Acrylic Crystal Plastic Iridescent Aurora Borealis Musical Theme Charm Mini Figure, approx. 1.5-inch (3.75cm) Tall x 1-inch (2.5cm) Wide on 18-inch (45cm) neck chain with safety clasp. Choose neck chain or cord!